EVERYBODY GETS ONE: Dr. Gadget Game Show Run-Through! Hollywood, CA – HOLLYWOOD JUNKET attended a special run-through session of a new game show aimed at GSN. Kelly Goode, Senior Vice President of programming at GSN, was in attendance along with about twelve other GSN network executives at the “Production Group” studios in Hollywood. We reported on a previous run-though of this same show, “Everybody Gets One!”, co-hosted by Dr. Gadget, who is best know for giving away prizes, including electronics on shows like “The View”. This particular session, brought-in Tanika Ray from “Extra” as his co-host, who was very upbeat, and pulled-through what seemed like a last-minute gig for her (receiving constant directions in her earpiece). 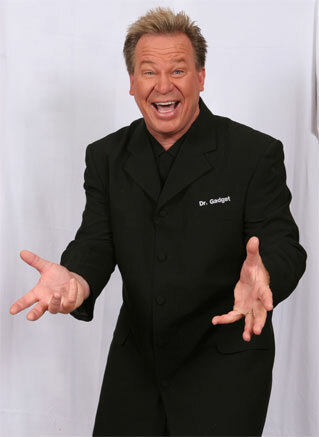 Dr. Gadget's new GSN game show makes the audience winners! A producer from “Catch 21” introduced the show’s games and rules, and explained that the audience of forty-five people is also the contestants. This producer also stated that this game show is “the best game show that I’ve ever worked on!”, and that it’s the “biggest show GSN has ever done!” Bigger than “Big Saturday Night”? As much as $277,000 worth of prizes are given out on one show. The audience is split into three separate groups of fifteen, divided by professions. For example groups may be: pet groomers, book-keepers, and school teachers. The game show consists of five games that every audience member has the chance to play. Contestants are selected from the 45-count audience pool by guessing the retail price of an item closest to it’s actual price. It doesn’t matter if they go over, as long as they guess the closest price. Whomever is the closest from each of the three groups, goes onto the stage to play the games, and to represent their group until they lose a round, then someone else is chosen out of their group in the same process of elimination. There are five games the contestants must get through. They are: 1) Square Deal – contestants must circle the four digit number from a crossword-style board that is closest in price to the electronic product up for grabs ; 2) Bag Your Bid, 3) Dress the Model – each contestant must dress one game show model in wardrobe totaling $5000; 4) Biggest Bargain – players must guess which product at a sale price is the greatest bargin among three pre-selected items; and 5) Dr. Gadget’s Produce Stand- each player must put fruit in a bag to make it weigh 5lbs. Each set of products is displayed and showcased by three beautiful game show models in a “Price is Right” type fashion. Players getting the closet in number to these games, win the prizes for their whole section, “everybody gets one!”, and also get bumped-up to the “winners circle” where they reside for the rest of the show at a corner of the stage, while another member from their group must earn a place on stage to try and join them. Winners can also be sitting at home! Dr. Gadget consistently reminds viewers at home watching to jump onto their computer to win prizes at the GSN website. After the fifth game is played, the five contestants in the “winner’s circle” get to compete for a new car. Each player selects a car door remote from one wall of remotes. Whomever selects the one that makes the car start, wins the car! The clincher, they also have the option to upgrade to fancier or sporty car by trusting their instincts to choose another correct remote to the upgraded in order to win it. If they select the wrong remote, they also loose the first car that they won. “Everybody Gets One” is a familiar show mix of “Let’s Make a Deal” and “The Price is Right!”. GSN is staying on track with their current theme of introducing interactive game show television with audience members as well as home viewers who can win prizes on the GSN website during the show. The show seemed to be well received by audience members there, with the exception of a few. One, who stated he thought it was boring and didn’t like the high energy. If it really is the “biggest show GSN has ever done”, then I expect it to do very well. However, I really could see this show taking-off as a web game show. Just a thought.